Images of the Earthly Realm! Welcome to Geotripper Images! What you will find here is a collection of geology/earth science related photographs which are available for use by educators and non-profit organizations to advance public understanding of earth processes and materials. High resolution versions of these images are available to publishers. For more information, click on the Image Use link. To get started, check the "Browse Images" button. Your suggestions and feedback are appreciated! 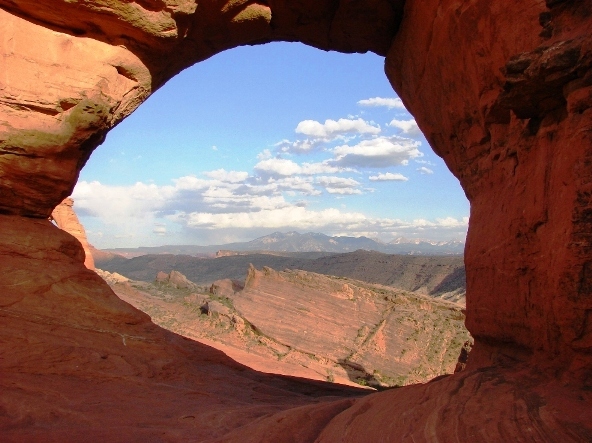 The La Sal Mountains seen through a small arch at Arches National Park in Utah. Geotripper Images is still undergoing development. PayPal functionality added and general housekeeping! © 2010 All rights reserved. Garry Hayes, 435 College Ave, Modesto, CA 95350.